Pindar Van Arman, an alumnus of the Corcoran College of Art + Design, has spent the last decade building robots that turn photos into paintings. If you’ve ever wanted to turn your selfie into the true work of art it deserves to be, Corcoran College of Art + Design alumnus Pindar Van Arman may be able to help with his latest invention. For the past 10 years, Van Arman has created five different robots – each involving a metal frame, a canvas and a moving apparatus that holds a computer-controlled paintbrush – that can turn photos into authentic works of art, brushstrokes and all. With his latest robot iteration, users will be able to upload a photo digitally and then alter it however they want by tracing on top of the image. 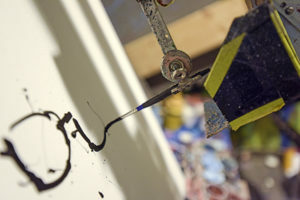 “Every brush stroke you’re making with your finger, the robot will go dip its brush in the paint and replicate that exact stroke,” Van Arman, who graduated from the Corcoran College of Art + Design with a master’s degree in teaching in 2010, said. Using what Van Arman descriped as “very, very loose artificial intelligence,” the latest robot can complete the portrait in the user’s style based on their pattern of brush strokes. “If you draw an outline of the eyes it will say, ‘Oh, you chose to draw black,’ and it will try and draw black everywhere it can find black, thinking that you’re working on black,” Van Arman said. He hopes to use a Kickstarter fundraising campaign to raise the money he needs to put the finishing touches on this latest robot, including adding more servers and speeding up the process of painting. He says the robot is 90 percent complete and, so far, he has reached 20 percent of his Kickstarter goal to raise $4,800 with one month to go. Once it’s completed, Van Arman hopes to set up a gallery space in D.C. or New York where visitors can take a photo of themselves on a tablet, edit the photo with their own brushstrokes and then watch the robot create the portrait in under five minutes. Van Arman said people will be able to walk away from the gallery with their portrait in hand. “It’s all about it being exciting and painting really fast,” he said. Van Arman’s robot uses artificial intelligence to make brush strokes to match the style of the paintings it is replicating. With each of the five robots he has invented over the years, he has incorporated a new innovation. 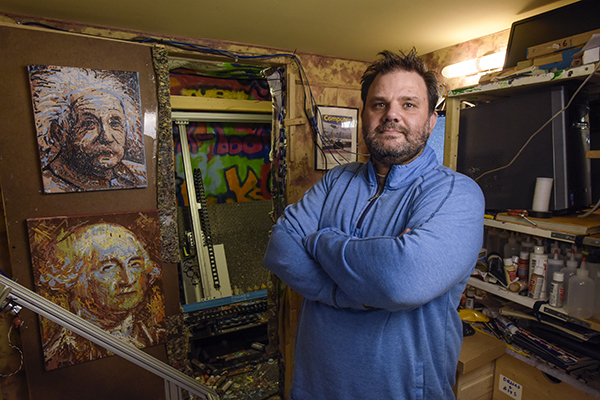 For his fourth robot, he turned the making of the artwork into a collaborative process by allowing users on his website, Crowdpainter, to alter the photo using a virtual paint palette that mimics the palette of the robot. Users can then watch a video feed of the robot painting these changes. One video on the website shows the struggle between a group of users turning a picture of Abraham Lincoln’s face into a tic-tac-toe board and other users commanding the robot to paint over it. Van Arman said his website was flooded with more than 200 people trying to collaborate on the artwork at the same time after he presented the robot on the main stage of Google’s Made-With-Code Launch Event in 2013. “It was like this big crowd-sourced painting fest,” he said. When vandals began adding crude symbols like swastikas to the art and started trying to hack into Van Arman’s server, he shut down this aspect of the website. Van Arman said he got the idea for the robot when he entered a contest to make a self-driving car while working for a small, start-up Internet company, Innovectra, in the late 1990s. When his car failed, he focused on other, less-expensive actions he could teach a robot to perform and decided on painting. He was inspired by the idea of making portraits when he taught art at Gonzaga College High School in D.C. while getting his master’s degree and saw how proud the students were when they were able to achieve likeness in their portraits. However, Van Arman, who likens the graphic and colorful robot portraits to Andy Warhol’s works, said the main goal of his robot is not the portrait itself.